Studies indicate that a company’s - in particular a supervisor's - response to a workplace injury is an important influence on the quality and speed of the worker’s recovery and the success or failure of the stay at work or return to work outcome. A supervisor’s response may be the single most important influence on whether a worker reintegrates successfully into the workplace following a workplace injury. 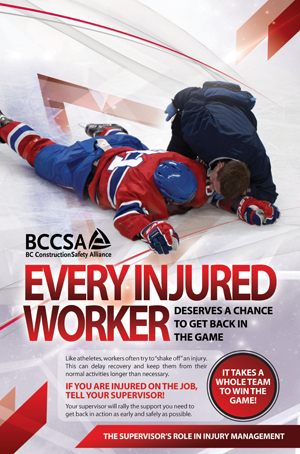 The BCCSA offers a comprehensive injury management service designed to assist member companies to (a) help their injured workers stay at work, performing regular or modified duties, or return to safe and meaningful work as soon as possible; and (b) understand and control costs associated with workplace injuries and illnesses. 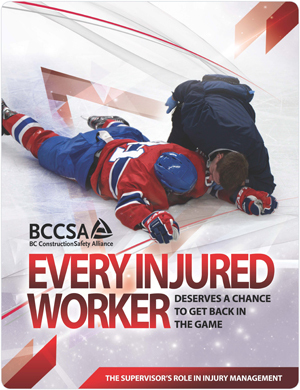 For information and guidance on Injury Management or how to make the best use of the following resources call 604.636.3675 or toll-free 1.877.860.3675 and speak to our Injury Management Advisor today. Overcoming common challenges inherent in injury management using practical techniques. The booklet can be utilized as part of a company’s overall injury management training (for supervisors, designated injury management coordinator etc.) and/or a reference guide throughout the injury management process. Call us toll-free at 1.877.860.3675 to get a copy of the handbook mailed to you. Accompanying the handbook is an 11 x 17 poster with messaging aimed at workers. This poster can be placed in high traffic locations around the workplace (i.e. lunchroom, site office, first aid trailer etc.) to help promote the company’s injury management program to employees.